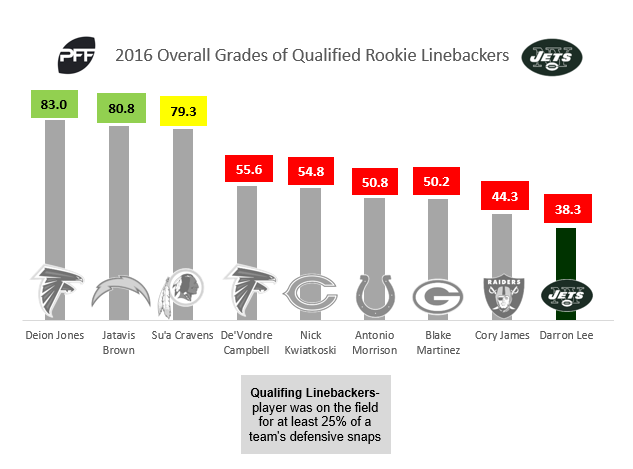 Can Darron Lee take a step forward in his second season? After being selected 20th overall by the New York Jets in 2016, Darron Lee struggled with both his play and injuries in 2016. If Lee is going to live up to his lofty draft status he’s going to need to turn things around in multiple areas in 2017. Lee finished 2016 with a 5.7 run-stop percentage, which ranked 54th out of 60 qualifying inside linebackers and last among eight qualifying rookies. Lee also struggled when asked to rush the quarterback, earning a pass-rush productivity rating (a rating that measures pressure created on a per-snap basis with weighting toward sacks) of just 6.8, which ranked 51st out of 57 qualified inside linebackers. Lee struggled in coverage in 2016 as he allowed one reception for every 7.2 snaps in coverage, which was the fourth-worst rate among 57 qualified ILBs. He also allowed 1.24 yards per coverage snap, which ranked as the eighth-worst rate among those ILBs. All linebackers need to be able to tackle and Lee was hit or miss in his rookie year. He missed one out of every 11.5 tackle attempts versus the run (38th of 64 ILBs), but missed just one out of every 23 tackle attempts against the pass, which was the eighth-best rate among qualifying inside linebackers.